USD index, dollar is back! Strong week for the US dollar, the best in the last 5 months. At first, strong weekly trendline stop the fall and pushed the usd in the middle of October from 93.80/94.00, after wich the stong return was inevitable in the previous week after Mr.Draghi. In the previous week the index has broke all resistance areas easy in only two days and reach the strong weekly down trendline at 97.20. You can see how heavy the us dollar broke the MA’s on the way down in September and how easy on the way up in the last week. Well, that’s how the US dollar bulls are serios in 2015. They cover each decline strongly and hold the gain after for days. Take a look at this roller coaster from August. Amaizing isn’t it. 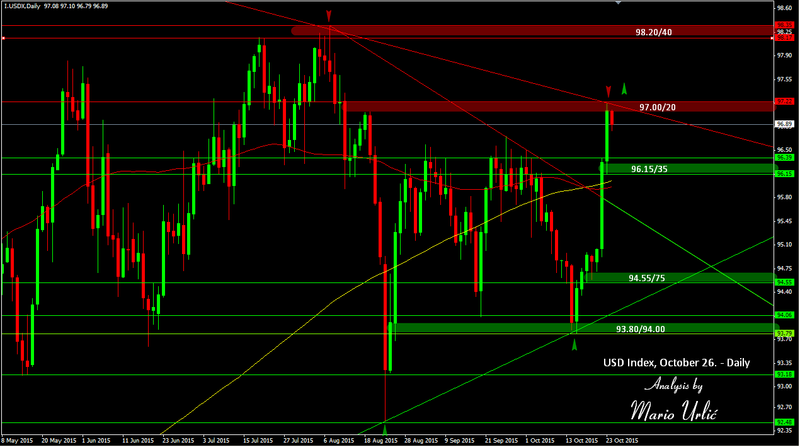 Ok, this level at 97.00/20 is strong resistance now and eventual brake up could push the dollar even higher to 98.20. On the way back, stronger support is waiting at 96.15/35. Interesting return for sure.